Penguin Random House, 2017, 32 pp. The classic tale of a prince searching for the perfect wife and an overbearing mother who has her own tests in store for the potential princess is one that many readers are familiar with. However, it becomes a little less familiar when the story setting is Peru, the main characters are Indigenous people, and the story is told in a mix of English and Spanish. 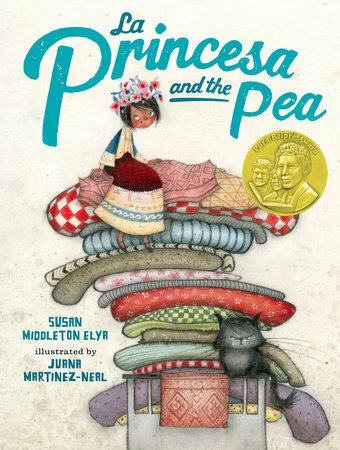 This picturebook is a Latin American interpretation of the classic tale, “The Princess and the Pea.” The Prince’s mother puts the potential princess through the ultimate test, which only a princess can pass. After assuming she is not fit for the throne because she is a peasant, the Prince’s mother comes to realize that, indeed, the princess is right for her son. As a spin-off from a classic Hans Christian Andersen tale, Susan Middleton Elya creates a new kind of mystical fairytale, one told through the outstanding illustrations of Juana Martínez-Neal. By highlighting words and phrases in Spanish, this story presents bilingualism as an important part of the narrative. Perhaps Elya’s motivation for this alternative take stemmed from her many years studying Spanish, a language not native to her, or perhaps it stemmed from her travels through various Latin American countries. Nevertheless, it is without a doubt that Elya’s take on this classic tale motivates readers to disregard language barriers, and promotes language sharing. Pairing possibilities could include other books with Indigenous motifs such as those found in works by Duncan Tonatiuh or Yuyi Morales. The collaboration between the author and illustrator works harmoniously to create a fictional world with just the right amount of cultural references to remind readers of relatable topics that can often be hard to find in children’s literature. For example, the artwork created by Peruvian-American illustrator Juana Martínez-Neal gives readers a peek into the old world of Indigenous Peru. Her use of light colors and detailed textures adds a feeling of mystery to the story. This book was a winner of the 2018 Pura Belpre Medal Award for Illustration, and was a nominee for the 2018 Ezra Jack Keats Illustration Award. The book was also selected for the 2018 NCTE Notable Books in the Language Arts and the Junior Library Guild. Though this book most likely targets a younger audience, its underlying messages can be used to promote dialogue about important values for readers of all ages. This story invites readers to consider that they should not jump to conclusions about how people look on the outside. Readers can derive a sense of open mindedness from reading this book, and combine it with the underlying message of language equality, to reinforce the importance of welcoming English Learners into an environment that utilizes their native language as a resource, as opposed to silencing it. For more information on the author and illustrator, check their websites at: www.susanelya.com and www.juanamartinezneal.com.